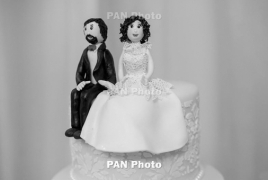 PanARMENIAN.Net - According to a study, making a marriage work is actually twice as stressful as raising a family, Marie Claire magazine says. Talking to The Telegraph, Dr Caterina explained: "Since women generally have a longer lifespan than men, married women may also suffer from the effects of caregiver burden, since they often devote themselves to caring for their husband in later life." She continued: "Widows cope better than widowers with the stress deriving from the loss of a partner and widowhood, with a significant increase in the risk of depression only in the latter. "Many studies have shown that women are less vulnerable to depression than men in widowhood, probably because they have greater coping resources and are better able to express their emotions. "These aspects may help to explain the lower risk of exhaustion seen in single women, who are likewise more socially integrated than single men, and consequently less exposed to frailty."